From The Dickensian , vol. 25 (1929): frontispiece. The Cratchits, all reasonably well-dressed and cheerful, have reached a fever-pitch of anticipation as the head of the domestic side of the Cratchit establishment brings forth the magnificent pudding with some trepidation, lest it not be fully cooked. Although some nineteenth-century illustrators such as E. A. Abbey and Sol Eytinge, Jr., had devoted some space to the Cratchits, elevating Bob to status of co-protagonist, the original illustrations by John Leech show Bob Cratchit only in the tailpiece, sitting down with his employer to enjoy some smoking bishop, a hot punch that Scrooge has concocted on his own hearth. Copping, working in the nostalgic vein after the First World War, elevates Bob to the status of quintessential Victorian Pater Familias revised, a kinder, gentler image of the Victorian father, head of a large family, struggling to see his children educated and having to cope with problems occasioned by his son Tim's illness and physical disability on a modest income, such as that which Dickens's father, John, received while a young father working at the Naval Pay Office (about 15 shillings per week, paid quarterly). If we compare Copping's treatment of the Christmas dinner with that in the American Household Edition by E. A. Abbey, "'Mr. Scrooge!' said Bob; 'I'll give you Mr. Scrooge, the founder of the Feast!'" (1876) we see a shift in emphasis. The earlier wood-engraving focuses the reader's attention on Bob, his cup raised, and Peter in the oversized collar; Abbey has crowded the younger children and female members of the family to the right margin, and the group are seated around the hearth after dinner. Conversely, Copping has realised an earlier moment, when the Cratchits are still seated around the dining table, cleared of dinner plates and awaiting the reception of the centrepiece of the festive meal, the traditional pudding, flaming with brandy. 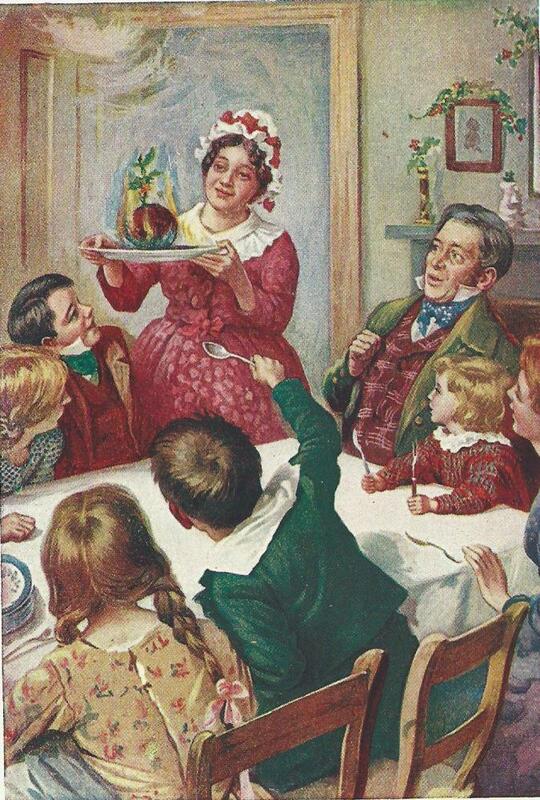 Mrs. Cratchit, in seasonal scarlet dress and matron's hat, seems almost mesmerized by the flaming pudding, keeping her hands well to either side of the platter. Bob, a secondary focus in the illustration, seems nervous,as if concerned that the pudding may not be fully cooked. However, the boisterous Cratchit children, utensils at the ready, do not share his trepidation. As opposed to the slight decorations evident in Abbey's wood-engraving (rear centre and left), Copping, exaggerating the economic status of the family, has positioned decoration and seasonal bric-a-brac on the mantle behind Bob, associating him with the spirit of plenty. In both, Tiny Tim is seated beside his father, but is clearly more robust in Copping's colour lithograph (no crutch is evident in either illustration). 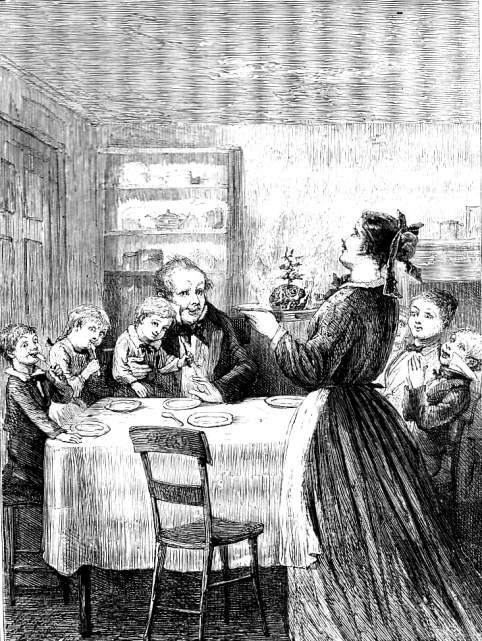 A comparable illustration showing the closeness of father and son and the family's enjoyment of the anticipation of the pudding is Sol Eytinge, Junior's "The Wonderful Pudding" from his Christmas 1868 volume devoted entirely to A Christmas Carol. 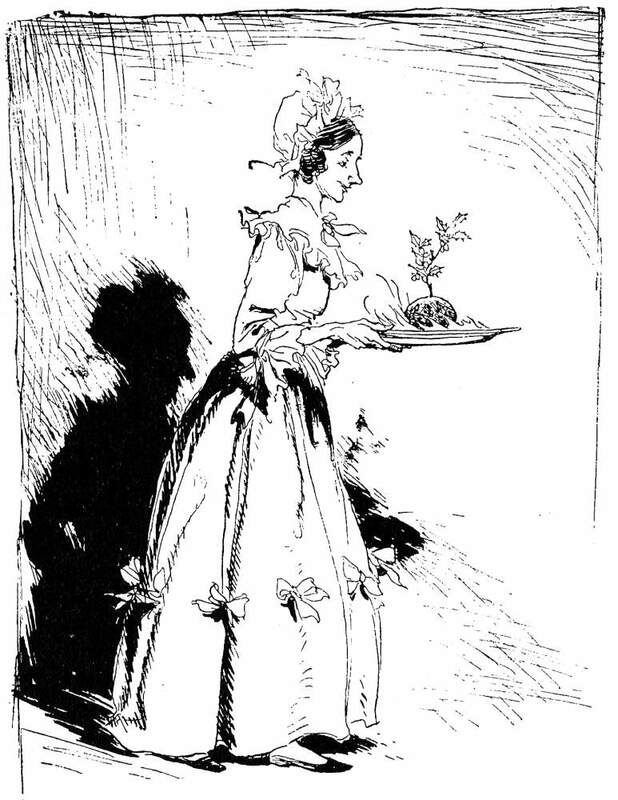 However, Copping is much more likely to have been influenced by the work of John Leech and Fred Barnard, neither of whom offer a comparable scene, and Arthur Rackham, who focuses upon the spare figure of Mrs. Cratchit's carrying the pudding in a single-page wood-engraving. The pictures of Rackham and Copping reinforce the traditional middle-class conception of the appropriate societal role for women, an image somewhat ironic in the context of a picture produced after World War One, when so many women took on male roles and jobs as part of the war effort. Davis, Paul. The Lives and Times of Ebenezer Scrooge. New Haven: Yale U. P., 1990. Dickens, Charles. The Christmas Books. Il. Harry Furniss. Charles Dickens Library Edition. 18 vols. London: Educational Book Company, 1910. Vol. 8. Dickens, Charles. A Christmas Carol. Il. John Leech. London: Chapman and Hall, 1843. Dickens, Charles. A Christmas Carol. Il. Sol Eytinge, Jr. Boston: Ticknor and Fields, 1868. Dickens, Charles. A Christmas Carol. Il. Arthur Rackham. London: William Heinemann, 1915. Dickens, Charles. Christmas Stories. Il. E. A. Abbey. The Household Edition. New York: Harper & Bros., 1976. Slater, Michael. "Notes to A Christmas Carol. The Christmas Books. Harmondsworth: Penguin, 1971. Rpt. 1978. Pp. 257-261. Simons, Paul, and Will Pavia. "Dreaming of a white Christmas? Put it down to Dickens's nostalgia for his lost childhood." The Times. 24 December 2008. Page 4.